The Northern Ireland Football Federation is very old. It was founded in the year 1880 and it took them sometime before joining FIFA in the year 1911, and even more to take the decision of becoming a member of the UEFA continental body in 1954. The first international match for Ireland National team before the division was against England on February 18, 1882 in the Capital City of Belfast, but in ended with a humiliating defeat by 0- 13, the heaviest defeat for a united Irish team. As for the Northern Ireland team, their 1st international match took place on October 3, 1953, where they lost at home against Scotland. Concerning the biggest win of the United Ireland, it was against a neighboring Britisho team, Wales on the score of 7-1 on February 1, 1930. The Northern Ireland National team had never participated in any of the editions of the Euro Finals. They will live their first experience in this competition. The Northern Ireland coach, Michael O'Neill (46) does not have a rich experience in the coaching field that he joined in the year 2006 with the Scottish club of Brechin City. He shined in his second task with the Irish club of Shamrock Rovers, with whom he won the league title in two occasions (2010 and 2011). Then, he had the opportunity of coaching the Irish National team in his first international experience starting from December 28, 2011. Reaching the Euro Finals with Northern Ireland for the first time in their history, is a major unexpected achievement, especially that what had been done in 34 matches under his supervision was not encouraging at all. They had only managed 9 wins , 13 draws and 12 defeats. 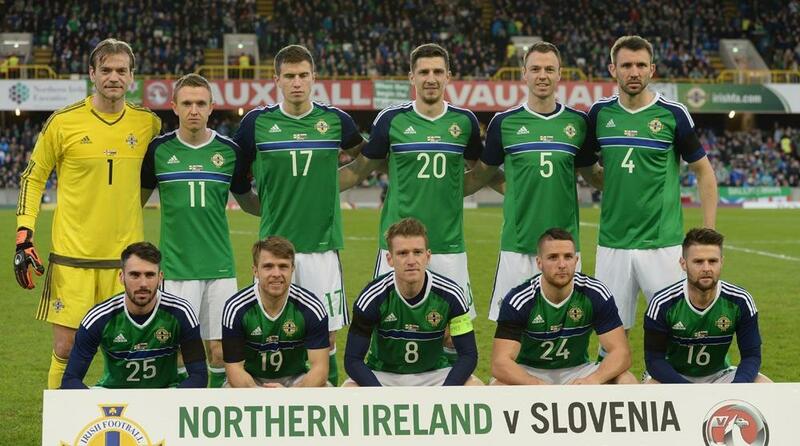 Through the European qualifiers, Northern Ireland, managed creating one of the biggest surprises, along with the one of Albania who reached the finals by finished runners-up in group 9. Northern Ireland under O’Neil stunned the whole of Europe by topping the group 6 with 21 points. The group featured also the teams of Romania, qualified as runners-up, Hungary 3rd (16 points) also qualified through Play-offs, in addition to Finland, the Faroe Islands and Greece. The teammates of the captain Steven Davis managed 6 wins, 3 draws and only one defeat. Their attack scored 16 goals while conceding 8.